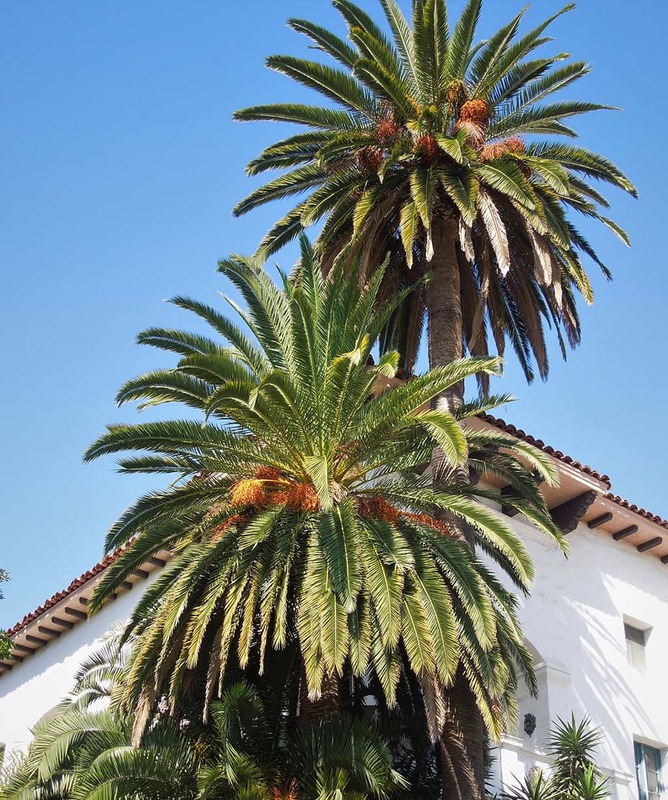 The magnificent and stately presence of the Canary Island date palm dominates any landscape. It certainly gives Santa Barbara the look and feel of a Mediterranean resort. This is truly a massive palm, growing to over 75 feet tall, with a stout trunk over 3 feet in diameter! Its dense crown, looking like the round ball of an exploding fireworks, can have up to 200 fronds, each of which are feather-like (pinnate), deep-green, gracefully-arching, and 15 to 20 feet in length. December to April, this palm will develop, between its fronds, multiple flower-bearing structures, called inflorescences, which are 4 to 6 feet long and are a conspicuously bright orange. On them will appear clusters of bright orange flowers; in early summer, these will ripen into 1-inch long, ovoid, yellow-orange fruits. These fruits are not like common edible dates, such as medjules, that have been cultivated by humans for over 8,000 years and that you can buy at most grocery stores or farmers’ markets – but, they are eaten by wildlife. The seeds are then widely-disbursed by birds and rodents, far from the parent palm, so they are often found growing in places where they were not intentionally planted by landscape designers! As its common name implies, this palm is native to the Canary Islands – which are located off Spain’s Atlantic coast – and which enjoy a climate very similar to our own. Consequently, though imported, it has done very well here, ever since pioneer horticulturists first started to plant seeds, all about town, over 100 years ago. 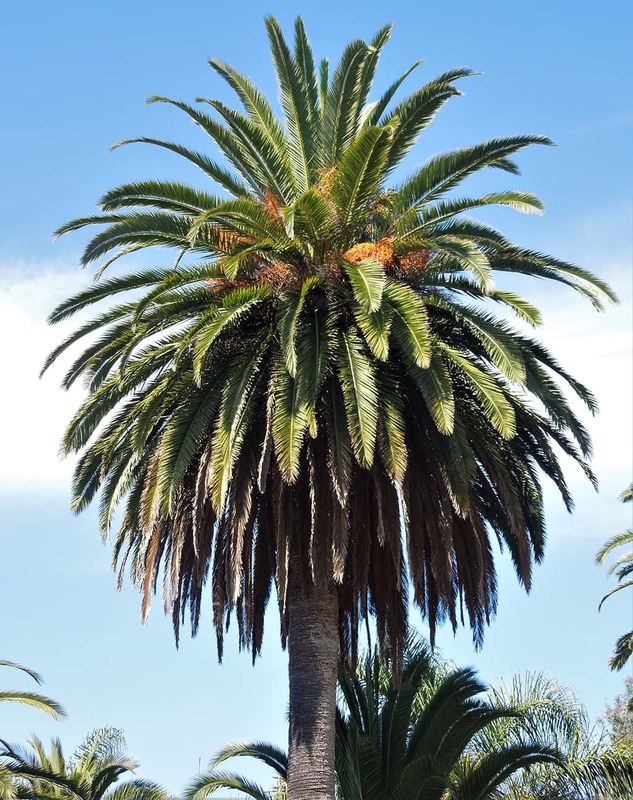 Its botanical name is Phoenix canariensis. Phoenix comes from the Greek and means simply “date palm”, and canariensis refers to its original home. Easily propagated from seed, it grows slowly until it develops a sturdy trunk – and then it grows much faster. When mature, it is very drought-tolerant. When young, it will look and grow better with occasional deep watering in the dry season. If the fronds become light-green or yellow, in the late winter or spring do apply a fertilizer formulated specifically for palms which contains the necessary micronutrients of manganese and magnesium. Fortunately, this regal palm is tolerant of most soils, even the poor types often found in our area. Unfortunately, it is susceptible to an incurable fungal disease, “Fusarium wilt”, which can be transmitted either through contaminated soil or through pruning tools previously used on a diseased palm and left uncleaned. Spread of this fatal disease can be greatly reduced, by properly disinfecting such tools before using them on another palm. Older fronds will turn brown with age and persist (hang against the trunk). Many landscapers will prune these off – leaving a handsome ball of brown frond bases at the top of the trunk, just below the newer fronds. Beware when pruning: the frond stems have sharp spines that require great care in order to avoid personal injury! The Canary Island date palm is most impressive when planted in long formal rows. It can also be planted in groups of three or more for dramatic affect. It may be a bit too big for smaller residential yards, but is perfectly suited for larger properties and for public spaces – like parks, boulevards, and commercial developments. There are many mature specimens in town, many of which are over 100 years old. They can be seen in Alameda Park, in Alice Keck Park Memorial Garden, at the County Courthouse – and, in double rows, along Las Palmas Drive in Hope Ranch and along the margins of Ambassador Park in the 100 Block of East Cabrillo Boulevard (the original entrance to the now long-gone Potter Hotel). Many smaller examples can be seen throughout town; they seem to pop up everywhere, whether planted or not!